as raged for a number of years between Disney fans is those who prefer Halloween or Christmas celebrations in the resort. Both have their particular merits, both are exceptional. 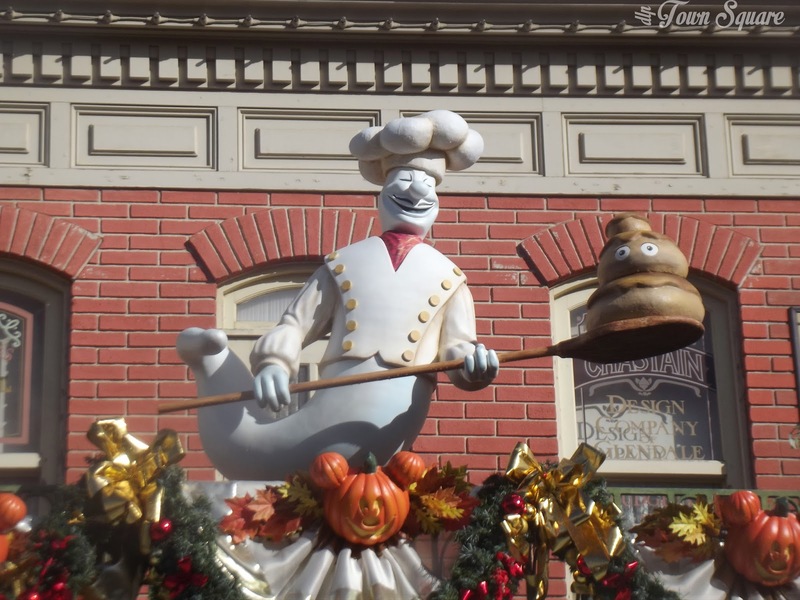 This year’s Halloween celebration has wowed all Disneyland Paris fans, but we’ve seen some strange and wonderful celebrations in the past. As a celebration in France, Halloween is still reasonably unknown, until the mid 1980’s, the only way French people really heard of Halloween was through foreign tourists passing through. This however changed when an American bar in Paris began to celebrate the festival, following on from that in 1992 the mask museum in a town called Saint-Hilaire-Saint-Florent opened and also played a roll in spreading the festival to a new French audience. In 1996, the town Saint-Germain-En-Laye (Just outside of Paris) held a daytime Halloween party to give a taster of what the celebration was all about. It is however, thanks to American influences on French culture such as Disney, McDonalds, Coca-Cola amongst others, this had two effects on French people: The first was educating French people into an American holiday, the second was imposing yet another aspect of American life onto the culture of France (do not forget this was one of the criticisms of the Euro Disneyland development). 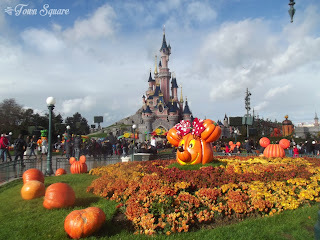 The first Halloween celebrated in Disneyland Paris (and in any theme park in France!) 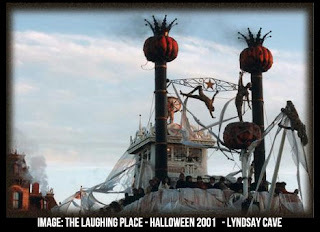 took place in 1997, although a relatively small affair at the time, it is clear that many of the original plans have become more permanent fixtures of what we expect from a Disneyland Paris Halloween today. The season consisted of pumpkin decorations in Frontierland and the addition of the ‘Mummy cruise line’ and a small parade on Main Street USA. The humble beginning of the Halloween Soirée was nothing more than a special night of entertainment inside Frontierland,with just 5000 guests in attendance. Critter Coral was where children of all ages could participate in various activities as well as meeting Disney Villains. Dress up was naturally encouraged, and those that did dress up could enter the Hurricanes night club in Disney Village for free! This party continued in 1998 and 1999 and even extended to taking place across two nights, these two years the park managed to reach capacity reasonably early in the day forcing the police to block off the motorway leading up to the park as it was blocking through traffic. The Halloween Soirée extended in 2000 to yet another night making it a total of 3 nights of Halloween celebrations (27,28,31 October); Frontierland once again became ‘Halloweenland’ and the night now covered Main Street USA, Halloweenland and Discoveryland from 21h00 until 2h00. During the season new decorations were being introduced into the park. Imagine entering Halloweenland through Fort Comstock only to see a giant spider overhead. Other than the ‘Mummy Cruise Line’, another big new addition included the ‘Spider Web Stage’ where guests could learn a new dance in the ‘Zombie Mania’ show, hosted by our undead friends. The Halloween parade was followed by a show named ‘Halloween Castle Spectacular’. The 2000 Halloween Soirée was priced at 149 FF (Which equates to about £20) offering the following special shows: Main Street USA: Hocus Pocas Concert, Disney Villains Parade, Halloween Castle Spectacular Discoveryland: Monster Mash DJ Party (Videopolis), Sarruga (Giant insects by Star Tours) Halloweenland: Sorcerers Apprentice (Arts & Crafts), Halloween Scarecrow Party, Zombie Mania. That’s not all, Disney Village also proposed a special Halloween offering with events such as ‘The Cabaret of Horror’, ‘Infernal Dances’, ‘Diabolical Karaoke’. As per the previous few years, the season at Disneyland Paris was still growing in 2001, the usual Halloween Happening parade was still happening on Main Street USA, and Halloweenland was still decorated in its Halloween best. Phantom Manor’s grounds also received some Halloween decorations this year, as guests approached the Pocahontas Village at the back of Halloweenland, they will have encountered the Trick or Treat Labyrinth, as you go through the maze, guests would knock at a series of doors in which they would encounter a cackle of laughter or a Disney Villain. 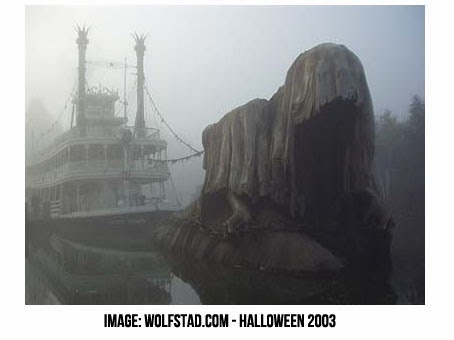 Cottonwood Creek ranch was awash with fantastic decorations such as pumpkins in water and giant hands pulling dead bodies out of a boat. 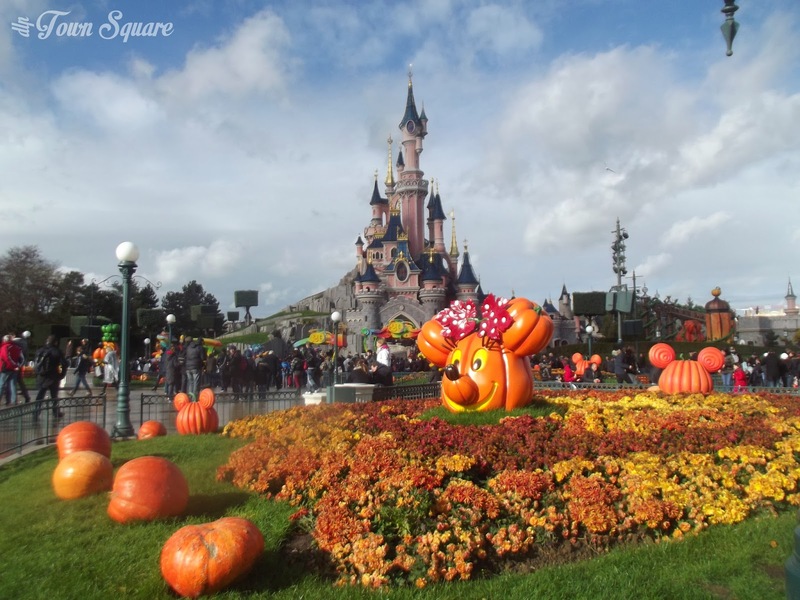 Disneyland Paris was becoming a real place to go after the Summer season during the October break period. The sixth Halloween season in Disneyland Resort Paris in 2002 extended the season once again towards Fantasyland, but this however would not be accessible on the Halloween Soirée nights which this year took place on the 31st October and the 1st November incorporating Main Street USA, Discoveryland, Halloweenland and Indiana Jones and the temple of doom backwards! The Disney Villains had moved from Frontierland to Fantasyland (where they remain to this very day), pumpkins had begun to climb up Sleeping Beauty Castle. Halloween themed menus were added to the Cowboy Cookout, Funente del Oro and Lucky Nugget restaurants. For the Soirée, a giant pumpkin was placed on the castle stage (much like recent years) for a special concert that entertained guests throughout the night. Other highlights included Dumbo the Flying Elephant manned by the Big Bad Wolf as well as shows on the Fantasy Festival stage. New Features: Villains in Fantasyland, Halloween Menus, Special shows and character appearances. Did you ever think Zorbing and Halloween could ever mix? 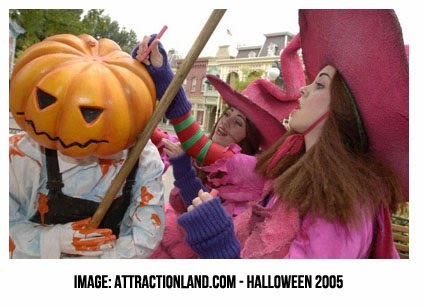 Well, in 2003 at Disneyland Paris they did, Main Street USA became a pumpkin paradise as the pumpkin men took over the Town Square’s bandstand, and even appeared in front of Phantom Manor in Frontierland. Cast Members working in Disneyland Paris also saw their name tag replaced by something a little bit more spooky. Disney Villains invaded the Princess Parade to make the event more spooky. Finally, one of biggest ever Halloween additions made an appearance this year as a ghost was attached to the Mark Twain who would pull in around the Rivers of the Far West. 2004 was the year in which Main Street became the rather unfortunately named ‘Spooky Street’ which was similar to the previous years. The Pumpkin men made their successful return, as well as a bit of a back story being created for them in ‘PumpkinWood’, HalloweenLand. The special villains parade and Phantom Cruise Line returned for a second successful run. Perhaps the most memorable thing about this edition of Halloween in Disneyland Paris was a spectacular projection show onto Phantom Manor during the Soirée. The story of the attraction was told through projecting onto a sheet which covered the attraction, as well as using lights to enhance the effects. The result is a thrilling one-off display which Disneyland Paris fans still mention to this day. In 2005, Disneyland Paris guests had a choice to make. Pumpkin Men or Pink Witches? The Halloween Witch had disappeared, the pink witches wanted to take over Halloween, but the Pumpkin men still wanted to paint the park Orange. Guests decided their camp. These new ‘pink witch’ characters joined in the Halloween parade which was invaded once again by villains and pumpkin men. A giant zip wire was built by the pumpkin men across the rivers of the far west connecting Thunder Mesa to Big Thunder Mountain. The pumpkin men returned to Main Street and HalloweenLand, Stitch became the main character of the Halloween season featuring on all the promotional material and was generally more present in the park. Stitch also appeared through the day on the FantaStitch stage in Halloweenland, where three different shows took place: Stitch and the Steals, Donald and the Bat and Goofy and the Magic Pot. The 15th Anniversary of Disneyland Paris saw the pumpkin men invading the park once again (but perhaps to a lesser extent than in previous years). Stitch once again took a prominent role and ‘took over’ the Once Upon a Dream Parade in the form of a short pre-parade. The pink witches had taken to the streets as giant versions of them roamed the park (as well as the face characters from previous years). Disney Villains’ Showtime spectacular also got introduced onto the central plaza stage in front of the castle. New Features: Halloween Pre-Parade, Roaming giant Pink Witches, Disney Villains’ Showtime Spectacular. 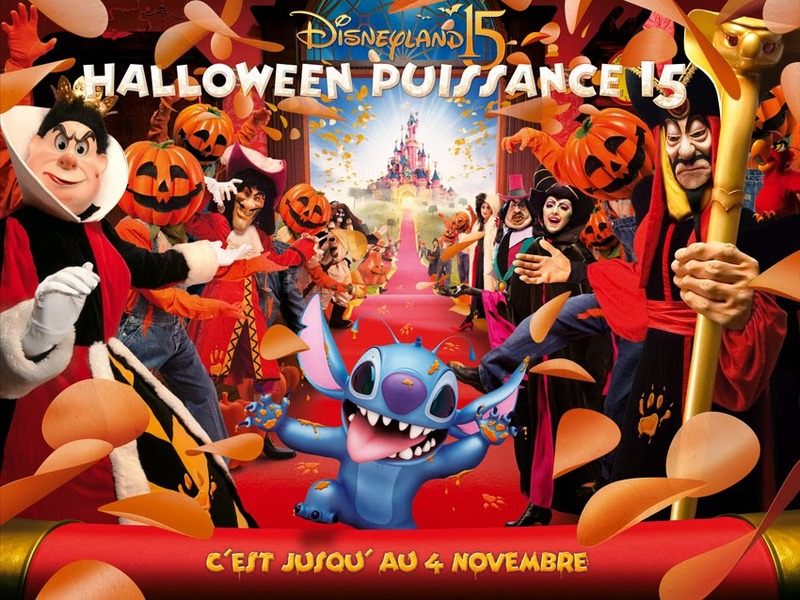 As the 15th Anniversary got extended for 12 months, Disneyland Paris launched into their (mostly unchanged) Halloween season. Central Plaza hosted a show hosted by Minnie named ‘Disney Villains’ Showtime Spectacular’, the Once Upon A Dream parade saw the addition of Jack and Sally during the pre-parade. The pumpkin men return for another year, but without the pink witches accompanying them, Stitch was also removed as the leading character of the season. For the first time Jack and Sally could be met on Boot Hill, the characters express would also get a Halloween themed make over. Following the massive success in the United States of the ‘Not So Scary Halloween Party’, the parties finally made in to the European resort, these 4 nights of entertainment saw Fantasyland given a new decor for the evening and some special Disney streetmosphere added with a finale in the castle courtyard. For a more ‘adult’ spook during this Halloween season, French retailer FNAC organised the inaugural Terrorific Night in the Walt Disney Studios park, this adult orientated event scarred guests with attraction make overs, and creepy cast member actors. New Features: Jack and Sally arrived at Disneyland Paris, Halloween Themed Character Train, Mickey’s Not So Scary Halloween Party, Terrorific Night. After the success of adding Jack and Sally to the parks during the 2008 Halloween season (albeit moved to Cottonwood Creek Ranch), they would be returning for the 2009 Halloween season (and every subsequent season since). The Pumpkin men returned to turn Frontierland orange. The year celebration that was being celebrated in 2009 was ‘Mickey’s Magical Party’, to celebrate this the character express had turned into ‘Minnie’s Party Train’, which received a Halloween makeover (much like the previous year). The show ‘It’s Party Time, with Mickey and Friends’ on the central plaza stage got a villain invasion. Last year’s Not So Scary parties return, with the addition of Frontierland to entertain guests throughout the evening. New Features: It’s Party time, with Mickey and Friends, and Disney Villains. The Terrorific Night in Walt Disney Studios returns for a second year after its first year hiatus, as well as the return of the Not So Scary party in Disneyland Park. This year saw the addition of the ‘Dreams of Trick or Treat’ float in the Once upon a dream parade in Disneyland Park, which featured Jack, Sally, Pumpkin Men, and the Disney Villains. Pride of place was given to the new arrival for the season, who was given a float to himself. After introducing Jack and Sally two years prior to 2010, the New Generation Festival saw a new character premiere, that of Doctor Facilier who took part in Disney Villains’ Showtime – Featuring Doctor Facilier. The pumpkin men return to decorate the park in their favourite colour, orange. New Features: ‘Dreams of Trick or Treat’: Pre-Parade float, Doctor Facilier. This year saw the addition of Mickey’s Trick or Treat in the Street show which took place of the Castle stage. This show was a blend of singing, dancing and games involving the audience which ran in both 2011 and 2012 Halloween seasons. HalloweenLand was finally removed from the Halloween festival leaving us with the simple Frontierland we know and love year round. Instead, Halloween was taken back to basics, pumpkins instead of pumpkin men. A new show was added onto the Central Plaza Stage (in the final months of its existence) ‘Malificent’s Halloween Party’ featuring all the Disney Villains. After the previous year’s back to basics approach, it was time to start on rebuilding the season in Disneyland Paris. The addition of the Main Street ghosts was universally applauded by Disneyland Paris fans for its tasteful design, Main Street was littered by the previous residents and shop keepers, who had come out to greet guests. 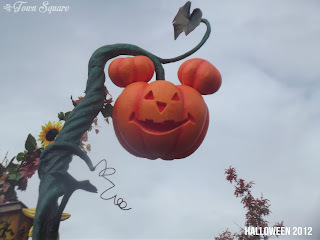 Pumpkin head versions of the Disney characters (Mickey, Minnie, Donald, Goofy) were added to the central plaza area. Goofy Bonbons was a new goofy meet and greet located in Town Square where Goofy would meet friends next to his candy machine, and new cackling sound effects could be heard throughout the street. Mickey’s Halloween Trick or Treat in the Street show remained on the Castle Stage. On a slightly less happy note, the Halloween Soirée this year featured the final ever appearance of Disney’s Fantillusion Parade. To date, this was also the final running of Disney’s Terrorific Night in the Walt Disney Studios Park. 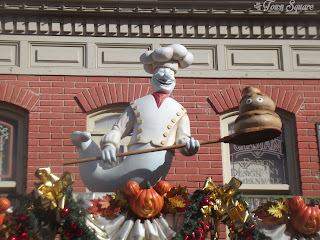 New Features: Main Street Decorations, Goofy Bonbons. 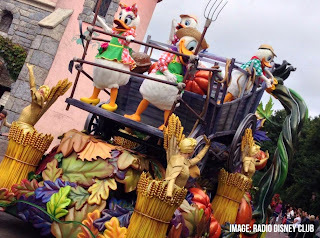 As Halloween continues to be rebuilt at Disneyland Paris, this year featured a substantial new addition in Mickey’s Halloween Celebration; a three-time daily parade taking the traditional spooky Halloween celebration in a new Harvest themed direction with its beautiful floats and country soundtrack. Numerous new Disney characters made an appearance, general improvements in decorations were also seen. A new Minnie Mouse photo location was added, and Duffy made an appearance in his seasonal costume. New Features: Mickey’s Halloween Celebration, Clarabelle Cow, Minnie’s Costume Couture, Duffy in a Halloween costume.Disneyland Paris has seen something new and exciting added to the season each year, whilst the smaller details change from year to year, the overarching themes remain the same, with the Disney Villains taking centre stage. 2013 saw a new style of celebration, which will be exciting to see how it is developed in the years ahead. One thing is certain, Halloween is much better known in France because of this American influence. 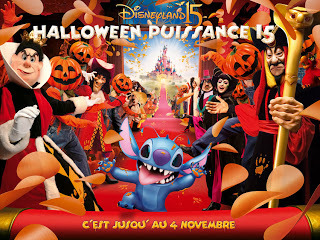 After the success of the reinvented Halloween season in 2013, Disneyland Paris continued this strong reinvention in 2014. The 2013 season focused on strengthening the harvest element of the season, 2014 saw the return of the villains. Maleficent was released on DVD and Blu-Ray during the season and it seemed that a tie-in was on the cards. A new float was added to Mickey’s Halloween Celebration, but the real star of the show in 2014 was Maleficent’s Court. This new seasonal decoration at the back of the castle is simply stunning and provided a wonderful backdrop to villain meet and greets. A Villain’s Promenade was also presented but this had less success as it was the first and last time it was seen in Disneyland Paris. New Features: Maleficent’s cout, a new float for Mickey’s Halloween Celebration, Villain’s Promenade, increased decorations. No big changes this year, the Villain’s Promenade does not return this season. In its place is an enhanced Maleficent’s Court and the new show It’s Good to be Bad with the Disney Villains which extends last year’s villains show and moves it to the castle stage. New features: New show It’s good to be bad with the Disney Villains. Once again, no big changes. It’s good to be bad with the Disney Villains is extended and improved.